Like Charlie Brown’s nemesis Lucy, Apple’s newest OS X El Capitan 10.11 mail app pulls the football out and Charlie (Apple’s loyal user) goes whoops! again, never learning. The connection between Jobs’ Lucy model and the girl who pulls the classic stunt is purely coincidental, or is it? As are the widespread, much discussed and pondered, problems connecting Apple’s mail application with an existing Hotmail account; the “enter password” message pops up (and fails) despite deleting the account in System Preferences/Accounts and attempting to add it in again—and again. iOS 9.1 on mobile devices has a similar issue. After finding a way to work around the issue, one can credibly assume this is not a real bug but more a complication of increasingly complex security practices. I’ll go through step by step (with pictures even) about how I fixed it. Under your profile image a drop-down menu (above) lets you select “View Account.” Do it. Select “Security and Privacy” from the blue task bar. Select “More security settings.” Then scroll down in the options to App Passwords. By the way, I have two-step verification activated but that may not be necessary. Create a password. Important note: You will need to create a password for each device you are using Apple Mail and Hotmail on. I used three—iPad, iPhone, Mac Mini. 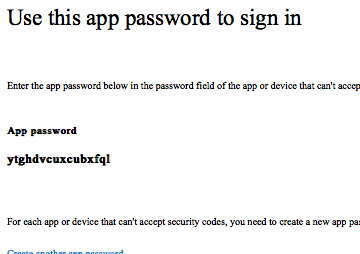 So COPY the password right away. I copied each generated password and pasted them into a new note that would sync with all three devices. Copy one password from the note and use THAT for the much-requested password in one device and check it, select options mail, notes, etc, and away you go. Use one unique password for each device.